This is the second of a two-part report on environmental and political issues over the proposal to feed the Dead Sea with water from the Red Sea. Filling up the Dead Sea could be just a pipe dream. Credit: Pierre Klochendler/IPS. EIN FESHKA, Occupied West Bank, Feb 26 2013 (IPS) - Two of the three main objectives of the Red Sea-Dead Sea canal project grapple with how to “save the Dead Sea” and “build a symbol of peace in the region.” With Israeli-Palestinians relations and the Dead Sea at an all time low, questions arise whether the ‘Red-Dead Canal’ (as it is known in environmental jargon) could save not only the hyper-saline desert lake but peace itself. If the grand project gets the green light from the World Bank, its implementation will depend on donors’ investment. The international economic climate is not auspicious. Jordan would be allocated the largest portion of desalinated water with 230 million cubic metres a year (Israel and Palestine would equally be apportioned 60million cubic metres a year), but many Jordanian environmentalists object to the project. “The whole plan takes place on Jordanian territory,” says Munqeth Mehyar, director of Friends of the Middle East-Amman. “And Jordan is hard-hit by the global economic downturn. That doesn’t bode well for international aid. “Besides, the project will only employ 1,700 people and only during the peak years of construction,” he says, referring to the World Bank’s feasibility study released in January. Above all, for the canal to come into existence and thrive, cooperation between the three beneficiaries who share the Dead Sea will be critical. This, in turn, depends on the political situation. On the outskirts of the Palestinian oasis town of Jericho just north of the Dead Sea, Palestinian labourers are busy planting date palms in a field which ‘belongs’ to an Israeli settlement. “We have no access to the Dead Sea; it’s occupied land. How could such a canal help us?” says a Palestinian labourer. “We don’t call the Dead Sea ‘occupied’,” retorts Silvan Shalom, the Israeli minister for regional development. “The canal could lay a strong basis for peace had the Palestinians not been left away from it,” says Mehyar. Comments from all sides point to present and potential conflicts over the project. “The project won’t serve its peace-building purpose – unless the Palestinians are not in full control of their shores of the Dead Sea, not just in command of the project,” Mehyar stresses. Seduced entrepreneurs envision (prematurely maybe) the promised “peace dividend” in the form of Disneyland-style artificial lakes for recreational, touristic purposes in the Arava desert, ideally transformed into a “Valley of Peace”. But that might be putting the cart before the horse. Water (as in existing water resources, not new sources) is a core issue of conflict resolution between Israel and Palestine, and negotiations have been at a standstill since 2010. So, phasing and synchronising the complex political and technical elements stemming from the project idea will be the key to success. Aside from an implausible phased recognition by Israel of Palestinian riparian rights of the widening shores of the Dead Sea – rights over the exposed land is gradually becoming a bone of contention between the two parties – for any phased implementation to meet the project’s objectives, a minimal requirement of 75 percent of the full-scale scheme would need to be implemented. “The World Bank experts are telling us, it’s all or nothing – either we go the whole way or we don’t do anything at all,” protests Bromberg. Green activists prefer to throw their support behind a more modest combination of alternatives dubbed ‘CA1’ in a study of over 20 options published by the World Bank correlatively with the feasibility study. ‘CA1’ proposes desalination at the Red Sea and at the Mediterranean Sea, where there are already two desalination facilities (one of them, in Ashkelon, Israel, is the world’s largest); water importation from Turkey; and water recycling and conservation. Such a plan would require sustained cooperation between the beneficiaries and, in order to change patterns of water behaviour in industry and agriculture, a carrot-and-stick policy of incentives and penalties. 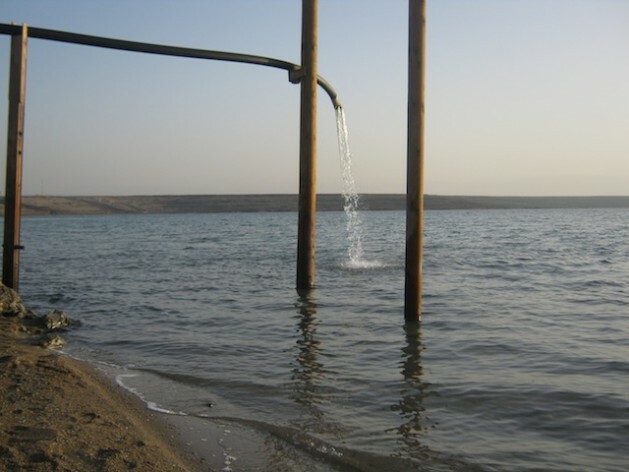 “These changes in water use could be incrementally achieved and would provide sufficient water to restore the lower Jordan River and stabilise the level of the Dead Sea above its current level,” the World Bank acknowledges. FoEME calls for restraint on development in absence of firm evidence that the ‘Red-Dead Canal’ won’t harm the environment. “Rather than a ‘go’ for one megaproject that will tie us up all for the next 50 years, we could implement several small-scale, flexible projects which are responsive to technological changes and which, together, will achieve the same results,” says Bromberg. It might be more feasible to change the course of nature than for political and financial interests in the Red-Dead Canal to run their course, say advocates of the scheme. “All the parties, including Syria, pump water from the Jordan River. It isn’t solely in our hands,” Shalom admits. “These kinds of projects are very attractive to leaders: a fabulous cutting-ribbon ceremony; a 10 billion dollar project; ten companies who get the lion’s share; and a handful of people who become very wealthy,” says Bromberg. So, is a new dawn rising on the desert? Not as fast as the Dead Sea succumbs to lower and lower man-made tides, vanishing in the glistening mirage of its own restoration. Just ask FoEME. How short sighted the Israeli leadership is. If instead of engaging in apartheid as they are doing today, embraced peace instead, then they could help build the powerhouse of the M.E. that is really needed. The warmongering is stupefying, leading to destruction of all people involved. I doubt the average Israeli wants apartheid and the Palestinians are tired of it too.